Carrots may be America's favorite vegetable, but they sparkle with flavor in Sephardic recipes, too. 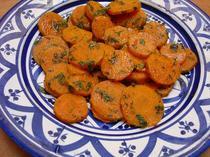 There are lots of variations on Moroccan Carrot salads. I like this carrot salad recipe because of the terrific balance of flavors and its easy preparation. Just peel and throw the whole carrots in to simmer, slicing them after they are crunchy-soft is so much easier. Then just toss with remaining ingredients and set aside to let the flavors develop. Who doesn't love carrots? So good for you and they can be prepared in dozens of ways. 1. Cook carrots in large pot of simmering water for approximately 15 minutes. The carrots should remain firm. Remove from water. When cool to the touch, cut into 1/2 inch thick slices. 2. In a plastic refrigerator container or zip lock bag, mix remaining ingredients. Add carrots, seal and chill for several hours to overnight. Flavor improves with time, keeps about a week in a well sealed container in the refrigerator.